Peacebuilding may sound bold and lofty but it is something that Rotarians do every day. Rotary has always been about peace going back to Paul Harris and his remarks during World War I. Rotary was present at the birth of the United Nations and its Peace Fellows are deployed around the world. In Rotary Year 2015-16, District 5240 became a Peacebuilder District providing support to the Rotary Foundation Peace Centers worldwide. We also made a commitment to wage peace wherever we can – in our local communities and in communities around the world. The District 5240 Peacebuilder Club program has been designed to help our Rotarians enhance Rotary’s mission of ‘advancing world understanding, goodwill and peace’ through the promotion of programs and projects that support a more peaceful community and a more peaceful world. 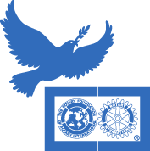 A District 5240 Peacebuilder Club is a Rotary club that is dedicated to diminishing the root causes of conflict: the need for food, water, shelter, health care, literacy, jobs, and human rights. The Rotarians in a Peacebuilder Club are committed to breaking this cycle of devastation and despair, and to helping create an environment of security through providing education, water, sanitation/hygiene, health-care and a chance at a decent future. A Peacebuilder Club uses peace education and peace principles to guide the club’s service and development projects. In many ways everything we do as Rotarians to improve the human condition, supports peace. When you feed the hungry, improve educational opportunities for everyone or help create a climate for community economic development you are peacebuilding. When you see injustices and assist in removing them you are peacebuilding. When you reach out a hand to people you don’t know, you are peacebuilding. If we can eradicate polio in our spare time, can our next goal – peace - be far behind.